Goodreads description--Lady Miranda Hawthorne acts every inch the lady, but inside she longs to be bold and carefree. Entering her fourth Season and approaching spinsterhood in the eyes of society, she pours her innermost feelings out not in a diary but in letters to her brother's old school friend, a duke--with no intention of ever sending these private thoughts to a man she's heard stories about but never met. Meanwhile, she also finds herself intrigued by Marlow, her brother's new valet, and although she may wish to break free of the strictures that bind her, falling in love with a servant is more of a rebellion than she planned. I actually read book 3 in this series first, An Uncommon Courtship (which I will be reviewing next week). I got that one for review and decided to buy this one as well with the intention of reading the entire series. I almost decided to read A Noble Masquerade first so that I would be reading the series in order, but I wanted to make sure I could review An Uncommon Courtship before the publication date. All of that being said to say that you could easily read these books out of order or pick and choose which storylines sound interesting. The characters do crossover as we're essentially following the relationships of a single family, but there's not an overall story arc as far as I can tell that you would be messing up by reading them out of order. I noticed while reading An Uncommon Courtship some similarities to Pride and Prejudice (and Downton Abbey) mostly in the areas of the UK where this story takes place. However, that was even more noticeable in A Noble Masquerade as Hertfordshire, London, Kent, and Derbyshire were all locations where the story takes place or were at least mentioned. As the description says, Miranda uses these letters that she writes to the Duke of Marshington as a diary or journal of sorts. She's been doing so for about 12 years as an attempt to get out the struggles she has with feeling confined by the standards of lady-like conduct. I totally relate to her taking to a journal. I did the same in my early years. It started out as a way to get my anger out of my head, and I journaled for years until I realized that the things I was putting on paper could be detrimental if they should be found or read by anyone other than me. And that's exactly what happens to Miranda. I personally would have liked to have seen more of the letters back and forth between Miranda and Marshington. They exchange at least 8 letters but we only get to see the contents of the first couple. I felt like this was a missed opportunity. I personally find the cultural differences between this period of history and now to be so fascinating. On the one hand, acceptable lady and gentlemen interactions were set up as to avoid even the appearance of a physical relationship outside of the marriage relationship. Of course, that's not how things always went. No matter the confines or structure of society, there will always be those who do not go by the rules. However, I find that so often when I'm reading books set during this time period that the couples might often be able to solve their problems with a little bit of communication. As one who has always felt like just saying what needs to be said often accomplishes what so many skirt around, I know I would have struggled if living in this time period myself. Or maybe I wouldn't having been raised within the culture. Regardless, I liked seeing Miranda and Ryland navigate society while also crossing the lines many times. Ryland is a bit too complex of a character to discuss in detail here as I don't want to give too much about him away. He's put in some situations that anyone would have difficulty navigating. I liked that even set inside this time period, Ryland has a job and circumstances that I could have never predicted. -She tried to behave. She really did. But how did one contain emotions when they felt happy or sad or scared? Didn't those feelings have to go somewhere? -...a lady never makes her family suffer because she is in a bad mood. -Amazing how such a little bit of light made the pathway so much easier to navigate. -"I'm not complaining. There's nothing wrong with what you've done. I'm sure that's not the best club you have in your hand, though. You presented something lower than your best in order to find something else. Well played." -Honor was all well and good, but good sense was valuable as well. I read A Noble Masquerade in one day. It was a quick and easy read that I've found I crave in this season of my life when I don't have as much time to read. The culture of this time period was a pleasant change from my normal reads as it ensures not much physical contact with the characters--which isn't always needed to tell a compelling story. I appreciated that the religious aspects didn't come off as "preachy" as can sometimes happen with Christian fiction. And perhaps the best recommendation that I can give is that I want more. I hope I'll be getting An Elegant Facade for Christmas. A Noble Masquerade gets 4 Stars from me. 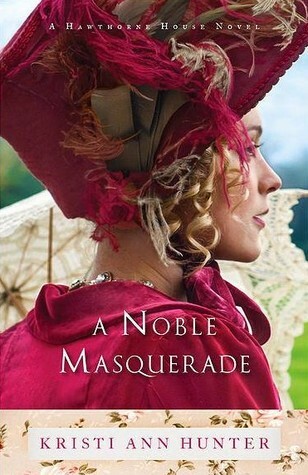 Have you read A Noble Masquerade? What did you think? Let me know! I've read the first two and loves them! Kristi does a great job bringing her characters to life. The only thing I didn't care for is that the second book goes back to the middle of An Elegant Facade, which is fun but also gets a little bit old. I still have enjoyed the books. Yes, I have noticed that there are some crossovers in timeline. But that doesn't bother me. I'm glad to find another fan though. Thanks for stopping by Amanda! Have you read An Uncommon Courtship? It was excellent as well! Yes, I've read A Lady of Esteem, A Noble Masquerade and An Uncommon Courtship. But I still need to read An Elegant Facade. Here's my review of An Uncommon Courtship. I really enjoyed it too.